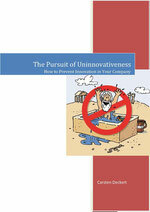 The guidebook “The Pursuit of Uninnovativeness” does for innovation management what Paul Watzlawick´s book “Situation is Hopeless, but not Serious – The Pursuit of Unhappiness” did for self-help. It shatters some of innovation management´s basic assumptions, mocks its mumbo-jumbo and mercilessly reveals its inadequacies and broken promises. Carsten Deckert shows the numerous methods companies and individuals use to prevent innovations and to make their lives and the lives of others generally uncreative and unimaginative. Hence it invites you to critically question some of your beliefs about innovation previously held dear and to put your own behavior – and that of your company – to test. The book is the English translation of the German book "Anleitung zum Uninnovativsein" by the same author. The English edition is published FOR FREE on this website. So please feel free to download it, print it for private use and share the link of the book with as many people as you like. Dr. Carsten Deckert, born 1971 in Aachen (Germany), studied mechanical engineering and industrial engineering at the RWTH Aachen University. He received his PhD at the Laboratory for Machine Tools and Production Engineering (WZL) at the RWTH Aachen University on the topic of knowledge management in product development. 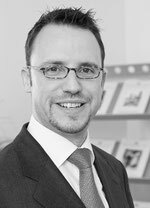 Carsten Deckert was shareholder and member of the management board of Deckert Management Consultants GmbH in Düsseldorf from 2001 to 2012. Since 2009 he is member of the board of directors of Deutsche Aktionsgemeinschaft Bildung-Erfindung-Innovation (DABEI) e.V., a non-profit organization promoting education, invention and innovation in Germany. Currently he holds the Professorship of Logistics and Supply Chain Management at Cologne Business School. Carsten Deckert writes the Knowledge Gorilla-Blog on www.carstendeckert.de.